Here it is finally, the first Community Patch. - Increased visual distance from max 20 units to max 50 units. - Visual distance is fully controllable from within the game. - Box count has been increased - groundbroxes shouldn't crash the game anymore. - Added a multitude of more modern resolutions. - Game should not crash if somehow wrong resolutions are selected (the resolution doesn't match the prefereddisplay in monster.ini). If resolution doesn't match it defaults to 640x480. - The 3dfx compatible resolutions (for those using nGlide) are clearly labeled with 3dFX. Do NOT attempt to try a different resolution, the game will crash. If you want to use 3dFX wide screen please select 856x480 and in nGlide 1.05 (mandatory 1.05) use the "fit to screen" option. - fixmore.pod is still needed! - If in Windows 10 the game refuses to go into full screen using Direct3D when using compatible resolutions (like 1920x1080 for example) try to run the game in compatibility mode using Windows XP SP2. I've had this issue and running with compatibility mode fixed it. - This only works starting with Windows XP Service Pack 3 and later. As mentioned, this is provided as is and while effort has been taken to try and get it working crash free, my knowledge of coding is at a beginner level, I am learning as I am going along. - Dashboard doesn't work. If you want to use first person view please use non-dashboard camera. - Software Renderer resolutions are unreliable. While most of them work there are specific tracks where it randomly decides to crash. Decreasing visual distance fixes the problem. - Track appears as completely black in Driver's CheckIn when you start the game. After a race it will display correctly. - Once you go above 1600x900, the checkpoint finder is a bit messy. It's still functional but ugly. - Instant Replay page has a weird bug with one of the buttons. If the grey box covers the other buttons then it stops you from being able to click on them. Sometimes a few reloads of the instant replay page is needed. The button itself works even if it looks like a grey square. - The joystick calibration has an extra green line to the left. Does not affect usability in any way. - 1536x864 - DO NOT WORK IN FULL SCREEN DIRECT3D!!! I'm starting to believe this might be a DirectX limitation based on the game behavior (game refuses to maximize even when only in the menus) hence there is nothing I can do about it. - EDIT: For the above comment, 1440x900 seems to be working for some people. - Multiplayer latency isn't calculated in the lobby (bar shows up empty or 0ms) but the game otherwise works correctly. - Fix black truck in driver's checkin. - Fix checkpoint marker - this might need to be replaced so I will have to look into doing that. - A fix to remove the menu bar during gameplay in Windows8/10. - Port the game to OpenGL - same reason. - extra options in the .trk file, namely a second set of axle bars and different front and rear tires. - Decoupling the physics from the FPS count. Right now the game physics (and AI behaviour) is dependent on the frames per second count. This means, the higher the FPS the more different the game behaves. Ideally physics will work the same whether it's 20fps or 100fps. Thanks to Cale for supplying the bulk of the pictures used in the patch. Thanks to Gamer121 for supplying HD artwork used in the patch. Cale: Since I've never touched the truck making aspect of the game, what exactly does your request mean when you say "different front and rear tires". As in... do you want to be able to use a different style of tires (different model)? The game forces you to use the same model for front and back? Exactly. The trucks have 6 tire models associated with them - 8, 10, and 16 poly-around left side tires, and the same for the right side tires. The game reads the base model name (say, "xxxxxx" in the .TRK and then looks for "xxxxxx08L.bin" "xxxxxx10L.bin" "xxxxxx16L.bin" models for the left side and "xxxxxx08R.bin" "xxxxxx10R.bin" "xxxxxx16RL.bin". This may well be a bridge too far for the game engine, since you'd need 12 models total for different front and back, unless the lower poly models could be dropped since there's no real performance limitations anymore. I'll look into it and see. Yeah the poly count doesn't seem to be the problem with the game, rather the number of 256x256 textures. Just superb. One thing though - 1440X900 works just fine for me. I'm using Direct3D, full screen, no problems. I'm still using Windows XP. Just tried this patch & i did a strange glitch with it. As i then configured a normal race it made a replay with the exact trucks & track i had. (Demo press any key to exit) in the left corner. This happened while in 1366x768 direct 3d as mentioned earlier. There is no such error "too demanding". If it gives an AV (which is a TRI induced crash) then most of the time it also gives a specific reason why it happens. If I know the specific reason it's easier for me to help. Anyway, I tried replicating and after several tries the demo tried a raintrack and the "too many headlights" AV happened. Will increase the limits for that. Edit: If you were running custom trucks it might also be a too many vertices AV error. (which has been increased for beta 0.35). It also displayed the same behavior of the game being stuck in demo mode. It's a funny bug Can be replicated in the original game too just that it's less likely for it to happen. Basically it happens every time you receive an AV in demo mode. Yeah didn't pay attention really too what the error was heh was keen on trying out the patch & how it looked ^^. Was quite fun to mess about with the replay glitch though. Bit confusing at first pressing the up arrow & ending up at the race won screen while it hadn't even let the trucks start rolling yet lol. Gonna give it a go on the laptop tomorrow with this patch & the native res of the laptop 1366x768. Forcing on 16x aniostrophic filtering & high texture quality makes the stock trucks pretty good looking at 1080p. antialiasing is still causing some render glitches like 3dfx does on my amd r9 280 heh. Yeah I can't force anti-aliasing on nvidia either. The best I can do is FXAA. Only problem I have is when I start the game and go to Driver Check In, the trucks are all black. After I run a race and go back then they have there paint. Yeah it seems that for some reason it's not initializing something, I haven't figured out what exactly yet because trucks like Monster Patrol for example, the additional objects like the big object on its back gets rendered correctly. Here's a little thing for you - whenever you try to load Dark Star for MTM2 immediately after a track with a dark background the game crashes. This is an old bug from the retail version of the game too. It's not particularly important but here's the error code if you want to look into it. Yeah looked into this, it's another error that's hard to track down since the line of code where it crashes is not where the code actually starts going haywire. Will have to go into the long-term fix list. Bravo guys! I'm sure there are some who think, "why are they wasting their time on this antique of a game". 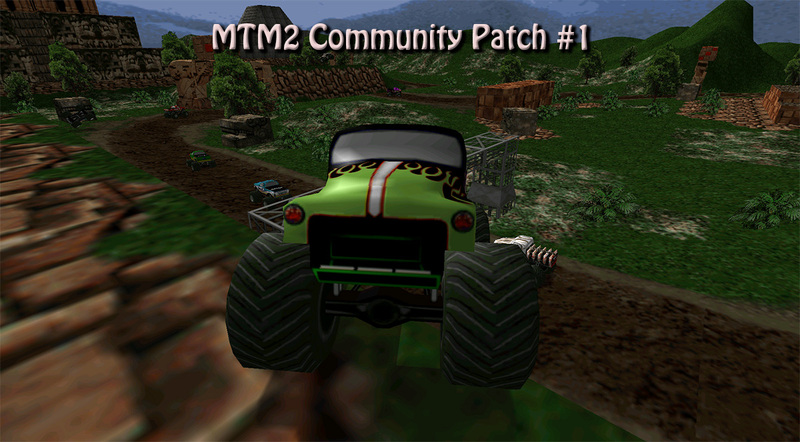 Some of us obviously are life-long fans who understand MTM 2 is a one-of-a-kind experience that (in my opinion) has yet to be supplanted by any other race game in terms of its variety and game physics. I've always loved it, and now with the time and effort you guys have put into improving it, it's even better. Can't say how much I admire the work you guys have done. Truly impressive! Hey Cale, I took a look at the tire model thing today (very superficially btw as I don't have the time yet) and I want to ask a few more questions. When you build the truck, is there a way to give it different tires or it simply doesn't allow you? Like, does the game give an error or what exactly stops you from being able to load different tire model names? (can you for example have two different models with the same name load up?) Like how does the process of adding tires work? (so that I know what I'm looking at when looking at the code). Or you can simply only add one single .bin file and it gets copy pasted on all 4 wheels? The reason I'm asking is because, superficially, looking through the code I can't see a specific game limitation but rather "we just wanna make this easy and we copy paste the one tire model all around". So I want to make sure the limitation comes from simply making it easier to code (and probably at the time it helped with performance). As you can see, the game looks for a model base name for the tires. There are then 6 different variants it looks for in the pod, with an alphanumeric suffix - 08L,10L,16L and 08R, 10R, 16R. 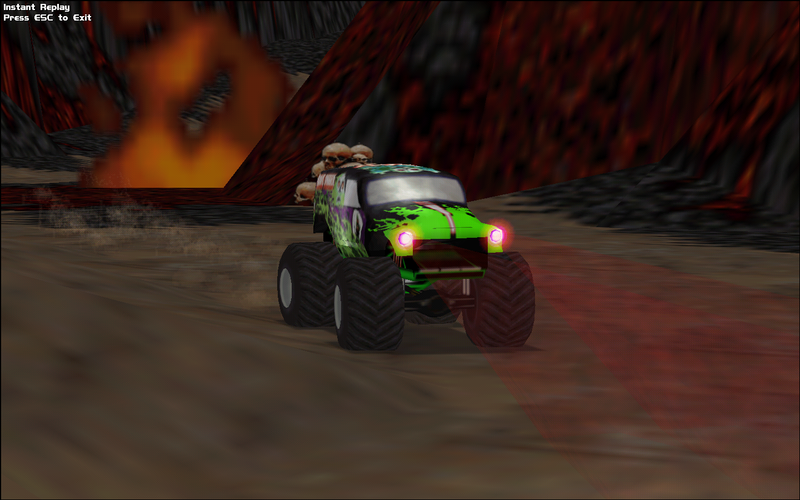 The numbers 08, 10 and 16 refer to the number of polys that make up the roundness of the tire - the stock game uses low poly variants for trucks in the distance to keep framerates down on the machines of the time. L and R refer to left and right, so you can have the treads and hubs facing the correct way on either side. I believe the game errors if you don't have one of those models in the bin, but I haven't encountered that in a long time, simply because it's so easy to copy and paste one model into the other 2 for each side. Much like the truck model bin (i.e. bigfoot.bin, bigfoot1.bin and bigfoot0.bin represent progressively lower polygon counts that get swapped out the further away the truck gets), no one does the low poly variants anymore because there's really no need, even a base level system today will run the game full speed without slowdown using most full-poly trucks and tires. Hopefully that helps. I don't know what it looks like coded into the game, but I also don't know how to code so I wouldn't be much help there anyhow! Has no one tried to use two different tire models but with the same bin name? Like let's say bfc16L and bfc16R are actually two different models but named the same. You mean like this? It's certainly doable, it's just going to look funny. Ah OK so that does work. Think I get it now. Basically based on what I understand from the coding, the game simply takes the input of one single (I know, different polygons but let's ignore that) tire model for left and one for right and it copy pastes. While you can trick it and have two different models for the left and right side, you cannot do it for the rear side and front side (which is the more natural thing to do). Think there will also be an issue of having the right creation tools for this. Let's say I manage to make the game intake the front/rear wheels correctly, we don't have any tools that will allow to build that correctly.